Funky Polkadot Giraffe: Iced Passion Tea Lemonade: Mmmm. . .mmmm Goodness! there had to be a way to make it at home. So, I started experimenting and BAM! I made a yummy, low-calorie version. Now my pocketbook and waistline are thanking me. tea to every 8oz of water. so that I would have enough concentrate for several glasses of tea. Let this steep for 10-15 minutes. I like to let it sit for a long time. Sometimes I even forget that I've got it steeping. then you've got your concentrate and you're ready to go! In my Aladdin 20 oz tumbler, I added lots of ice. 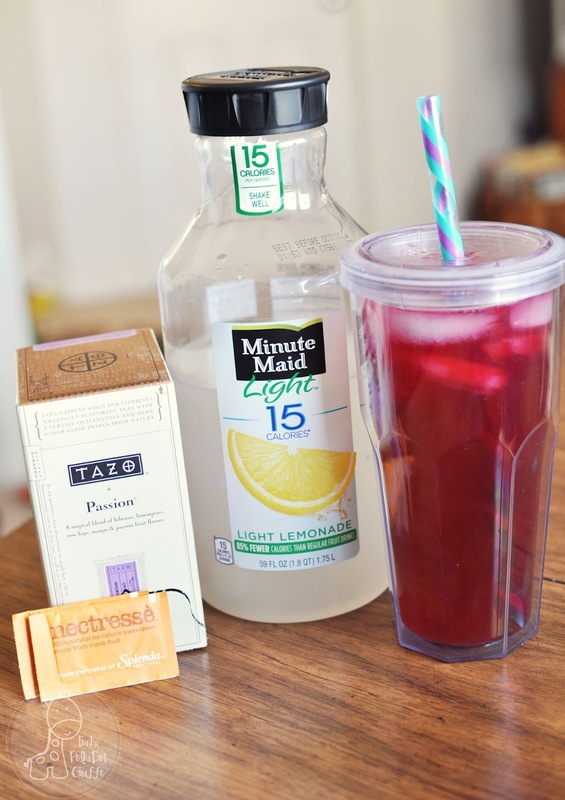 Then, mix 2 parts tea to 1 part lemonade. Really, it's all to your own taste. I fill the passion concentrate to just above the pattern/indents on the sides of the cup. and shook the dickens out of it. It's super delicious and the kids were crazy for it. And passion tea has health benefits - like calming and anti-anxiety effects. We can all use some calm in our life, right? Thanks so much for posting this! I bought some Passion Tea earlier this summer with the intent to figure out the proportions for this drink, but I never got around to it. Just a few notes on the shaking process and the sweetener. You could just stir the ingredients together, but the reason Starbucks shakes their teas is the aeration process does alter the flavor. I worked there for years and the teas were my regular drink and I could tell you the difference between a shaken and an unshaken tea not just by the flavor but also the looks. As for sweeteners, if you're used to getting the sweetener they use in their recipe, the "Classic," it's really just a simple syrup. So mix up a batch of that while you're waiting for your concentrate to steep and Voila! I hope this helps in creating that authentic Starbucks taste! Thank you for the tip. I will be making it for a family dinner I'm hosting tomorrow :) Thanks again!! What kind of syrup is the best? This beverage sounds divine! I haven't ever had one at Starbucks, but I love Passion tea. I'm going to make some right now! Question. I am about to make and I realize I have 6 "filter bags" in the box and they are pretty big. Would i still use all 6 to make the concentrate?? Question. The box I have says "6 Filterbags". Each bag makes one pitcher. I have a feeling this is different from what you used. What should I do??? However, I myself picked up the tea bags you are talking about, in which 6 come in a box. So, instead of brewing 8 hot tea, tea bags per 4 cups of water, the cold tea is telling you to use one bag per 32 oz. As we speak, I'm steeping my IcedTea Passion Fruit Tea in a 2 quart (62 fl oz) container. As the package states. So, in 2 quart container, throw your tea bag at the bottom, and then fill the container half way with hot water. Then let it steep. 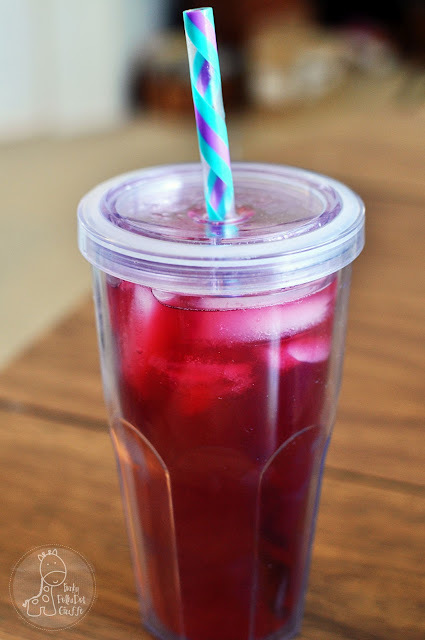 And then when your tea is cool or cold, you can put in either cold water or cold lemonade (Passion Fruit Ice tea Lemonade). I'm going to try using honey as a sweetener. Anyone tried it that way yet? 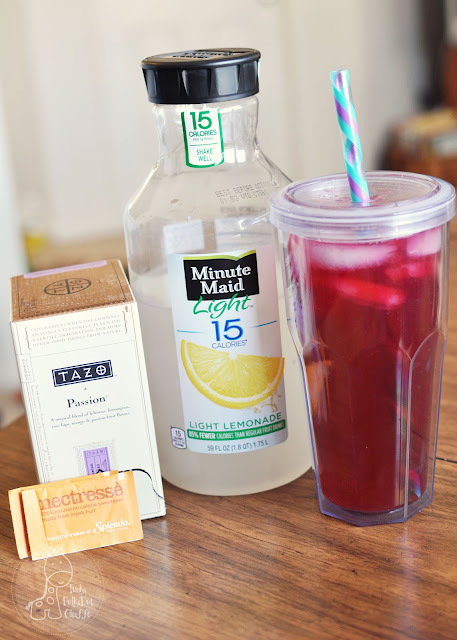 I also make this at home....but I use the TAZO passion tea concentrate!!! Much easier than making my own tea and you use less since it is concentrated, and it lasts for a long time in the refrigerator! !